When it comes to breathe taking natural beauty; in the way of giant snowy mountains, large winding lakes and endless acres of Conifer forests, Canada cannot be beaten. Below is a brief outline of just some of the amazing things you can do whilst visiting this magical winter wonder land! 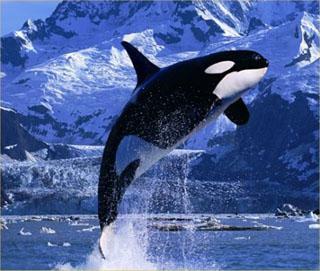 Ever seen a Killer whale in the flesh? Don’t let the name of these beautiful and magnificent mammals throw you…as they’ve never been reported to have attacked any humans before, but if you’re a salmon…then your days might be numbered! On the glorious banks of the Fraser River near Vancouver these spectacular creatures will bask in the ice cold waters that surround these parts and wait for the local salmon, which are located upstream, to spawn. At the end of their long wait the whales among other sea creatures, race to catch the fish before they escape out to sea and feast like they’ve never feasted before. The best way to spot these Whales is to hire a boat and follow them when they go to feed. When they have had their fill, many will do the famous belly and back jumps into the water…that do indeed cause more than a wave or two. We more than recommend going to see the spectacle that is these Killer whales which will leave you in pure awe and reverence. Fancy a white knuckle, water-raft on the world’s highest tides? 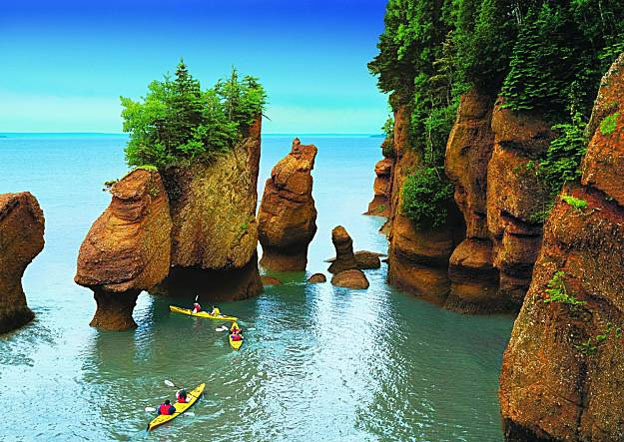 If you’re into extreme water sports such as water-rafting, kayaking and canoeing then ‘The Bay of Fundy’ and Canada’s ‘Nahanni National Park Reserve’ is most definitely for you! Here gets the world’s highest tides to record, with some reaching 15 meters at a time! Due to these extreme tidal patterns the Shubenacadie River in Nova Scotia is perfect for white water rafting, as you’ll be tossed from pillar to post by the strong, unusual currents present here. Depending on what point of the month you go, (i.e. the moon’s cycles) will determine how rough or calm the waves of the river will be. For those of you who are just starting out at these sports it is advised that you contact one of the rafting operators before embark on this wet and wild adventure…as you can get knocked about quite a bit, if you are unsure of what you’re doing. The South Nahanni River has a similar character but winds round the Mackenzie Mountains, so is perfect for the more experienced kayaking and canoeing enthusiasts among you. In the summer month this area tends be a lot more tranquil so you can take the whole family upriver for a relaxing paddle around the beautiful Canadian countryside. Think you can a handle a little pillow fight? Maria adores Canada holidays and just hopes Terrance and Philip don’t mind her talking about holidays to Canada in this post…c’mon buddy!